The Recipe is just to have fun! Remember to leave some white space and keep it Clean and Simple! Whoops! Paper pieced again this week! to finish I've added gems, enamel dot and glamour dust for added sparkle. My piccie of my birthday card for Lady Limette is lost somewhere in my camera memory, in the meantime here's a birthday card made with the negative space left after cutting a boat on my Portrait, for another card. Pink Petticoat sentiment. 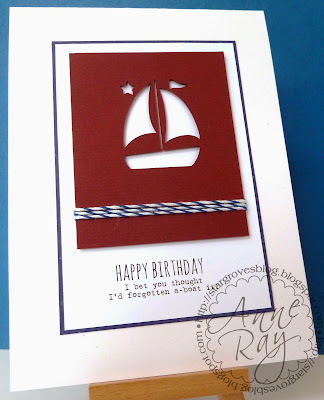 For my card this week I chose to use this Cuttlebug Embossing Folder. I inked one side with Distress ink, before running it through the machine, I was really pleased with the effect. The matching border folder was left un-inked for contrast. The single house was cut from a row of die-cut houses from Memory Box. Once again the sentiment was computer generated, using Jennifer Lynne and Problem Secretary Normal fonts. The mount is from a Die-Namics pierced stax die. I shall be on my way to Spain today ...and on my birthday too, with our daughter and grandchildren. What a fun time to be had. HAPPY BIRTHDAY CHRISSIE - wishing a wonderful (and CAS) birthday!! Lovely DT "inspirations" again today - I'm off to my craft table! I'll try again. Happy birthday Chrissie - enjoy! I may be a little late but...Happy birthday, Chrissie! :) Awesome cards, ladies! Apologies to everyone this week ... I've not visited many of you because my 'puter is taking about 3 minutes to open a blog and, as I'm sure you understand, with so many entries that's HOURS of time wasted .... waiting ..... and waiting! Thanks to everyone who has still visited my own blog and please accept my blanket "FAB ENTRIES EVERYONE" comment.